Welcome and thank you for visiting the Kennedy-Anderson Funeral Home & Cremation Services. We have prepared this website to provide you with important information that is easy to understand. Whether you have come to our site for information about an upcoming service or to make arrangements for one, we hope the information you find here will be helpful. Garrett Anderson, Owner/Funeral Director wants families to be able to focus on celebrating the life of loved ones and help you begin the healing process as soon as possible. We freely admit that death is a difficult subject to address and we recognize that the difficulty in discussing it is often overcome by a sense of relief when questions are accurately answered. We know that the loss of a loved one can leave you with a lot of unanswered questions, feelings of stress and anxiety and grief that makes events difficult to handle. We will guide you through all aspects of the funeral service with compassion, dignity, and respect. 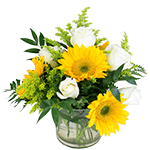 Garrett is available to assist you in making funeral service arrangements; from casket choices to funeral flowers. As a family-owned and independently operated funeral home, we are proud of the quality service and personal attention we offer each and every family. You can rest assured that we can assist you in your time of need.